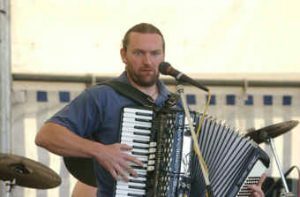 Jock the Box ace accordionist and leader of the fantastic Box O’ Bananas Ceilidh Band. An accordionist entertainer, composer, and above all, a performer with worldwide musical accomplishments spanning 25 years. Jock is an extraordinary musician with an individual style encompassing many genres and influences and entertains with his unique & infectious personality coupled with a versatile and fiery repertoire. He covers Scottish, Irish, Cajon and Rock styles. Touring has brought Jock international acclaim having performed throughout North America, Europe, Scandinavia, the Middle East, the Far East, Africa, Singapore, Malaysia and New Zealand. He has reently played at Strathyre Music Festival 7 the Sir Walter Scott on Loch Katrine His latest collaboration with none other than 'The Stranglers' sees Jock and his trusty accordion opening their shows. He is always working on new projects and is presently recording another album in the Netherlands. Watch out for his new collaboration which will feature some very unusual combinations and will guarantee a spirited and exciting performance designed for maximum audience enjoyment! ...................... further details to follow Jock has recorded with many top bands including:Box O’ Bananas -Album "Gaun Bananas" Kinlochard Ceilidh Band & Ceilidh Minogue to name a few.